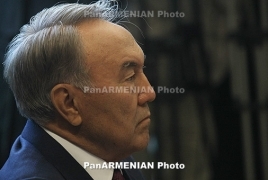 Kazakh President Nursultan Nazarbayev said at a session of the Collective Security Council of the Collective Security Treaty Organization on Thursday, November 7 that Minsk should appoint the next Secretary General of the organization. Days earlier, the CSTO Collective Security Council relieved Armenia’s Yuri Khachaturov of his duties as the organization’s secretary general. The move had been initiated by Yerevan. On July 26, Armenia’s Special Investigative Service accused Khachaturov of overthrowing the constitutional order in 2008 and requested his arrest. Khachaturov, who was the Commander of the Armenian Armed Forces’ Yerevan Garrison back in 2008, pleaded not guilty. On July 28, the Yerevan City Court of General Jurisdiction released him on his own recognizance and a bail of about $10,000. On Tuesday, acting Defense Minister Davit Tonoyan said Armenia will continue presiding over the CSTO until 2020. His comments came amid speculations that the CSTO is discussing the appointment of Secretary General of the Security Council of Belarus Stanislav Zas as the organization's new Secretary General. However, Nazarbayev told reporters after the session that all the heads of CSTO member states have said that a representative of Belarus should be the Secretary General.